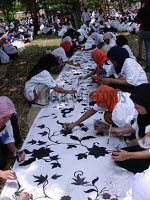 ‘The Batik on the Road’, a Batik painting, created by 1,000 participants on behalf of Pekalongan Batik Community, on September 16, 2005, in Pekalongan City, Indonesia, measuring 1,200 sq. metre, is the largest Batik painting in the World. Comments for LARGEST BATIK are now closed.